Illustration for the first issue of Arkitektnytt in 2019: The arguments and wishes are many and not all in unison when it comes to the relation between city and living qualities in accordance to how we build new extensions of a city. A block based city plan grid with the old and true buildings in square-structures surrounding their own free space (norsk: karré bebyggelse, bygård) or a lamellar planning structure (norsk: lamell bebyggelse), where free public spaces are less sparse and visibly accessible, streets are further from the buildings and newer values and rules, like optimal sunlight conditions, gets to decide at the expense of other qualities. Why can’t we keep on doing the former opposed to the latter? What gives the area the highest city AND living qualities? Illustration concerning the increasing practice of changing architects during a project. Portrait of Peter Butenschøn, who has written a lot about architecture over the years with an intelligent and critical eye, now has a new book out in stores; "Husimellom". In this one he writes about how norwegian architecture has shaped us. Illustration for issue 9/2018 of Arkitektnytt. A look into three ways of approaching city development; Focus on women, use of micro-big-data and user involvement. Illustration for issue 8/2018 of Arkitektnytt. Main topic; 80 % of all that needs to be built is already built. Architects need to to think in new ways when it comes to changing and preserving. It will be transformation puzzle. Illustrations for issue 7/2018 of Arkitektnytt, covering the Architecture Biennale in Venice this year! 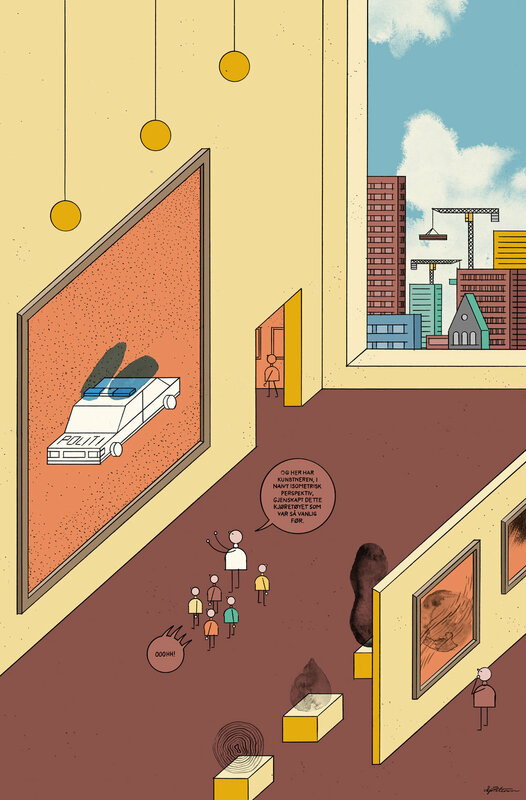 Illustrations for issue 6/2018 of Arkitektnytt, concerning the current state and future of Arkitekturmuseet at Bankplassen 3, (which celebrates it's 10 year anniversary this year), in the context of the brand new Nasjonalmuseet building scheduled to be finished in 2020, combining several major museums in Oslo. As my first illustration shows, the architecture museum has been on the brink of being swallowed by the new national museum. And now it’s safe to say that all the birthday balloons are deflated and the architecture museum can reside where it is. Car free Oslo on the march! The uncertainty in design of prisons, what kind of buildings that is most suitable. And about crime free city development, architecture as a crime repeller. Cover and opening spread. Magazine visual identity by Bielke&Yang and editorial design by Erland Banggren. The plan to move Bodø airport a brief distance to a new location, while the old one will become the site for a city expansion. Illustration for Arkitektnytt, issue 2/2018: In 2015 the Norwegian government put an end to their support focus on young architects. 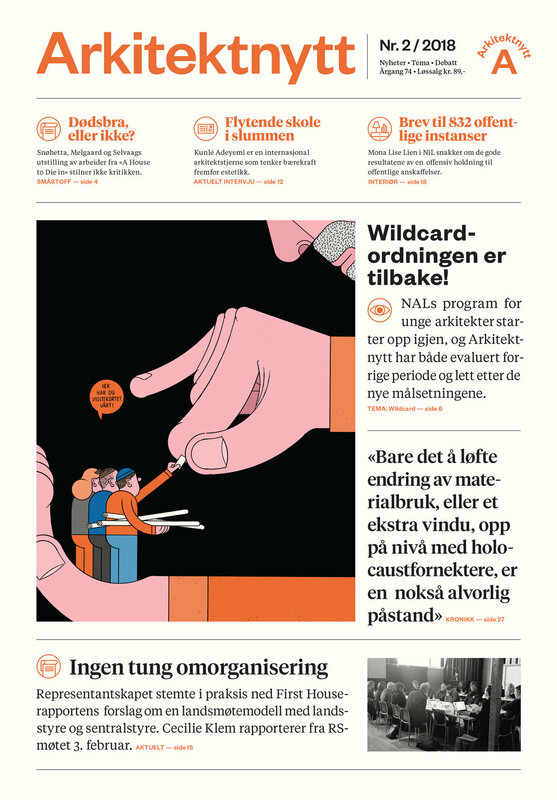 NAL (Norske Arkitekters Landsforbund) is now rekindling the Wildcard-initiative! Illustration for Arkitektnytt, issue 1/2018: The city architect returns! The city of Bergen's new city architect, Maria Molden, thinks the densification strategy has been at the expense of quality. She wants to do something about it. Cover and opening spread. Design by Bielke&Yang and editorial design for this issue, by Erland Banggren. Illustrations for issue 10/2017 together with a main topic article written by Mikael Godø about experimental conservation. How should architecture preservation survive when a growing amount of the architecture of tomorrow is getting pushed into preservation worthy frames of value. Arkitektur- og designhøgskolen in Oslo wants to create conservation developers – an architect who dribbles between both history-less builders and conservative protection authorities. Illustration for issue 9/2017 together with an article written by Mikael Godø; One Year with Bylivssenteret (in norwegian; Ett år med Bylivssenteret). NAL's (Norske arkitekters landsforbund) project, Bylivssenteret, shall raise norwegian municipalities in order to create more sustainable city centres and order better architecture. Illustration for issue 8/2017 together with an article written by Mikael Godø; In excess creative (in norwegian; I overkant kreativ). In 2002, Richard Florida conquered the world with his book, The Rise of the Creative Class. In his new book, The New Urban Crises, he apologizes his own influence. Arkitektnytt looks closer on what Florida has meant for urban thinking in Norway. Illustration for issue 7/2017 together with main article; Responsibility distinguish between architects and interior architects stands in the way for collaboration and holistic design, but are maintained by the the builders nevertheless. Illustration for issue 6/2017, concerning the substantial influence of politics on architecture development in Norway. Amusing idea process where the concept hit me while building card houses a sunday afternoon, then using a lion (assosiated with the Norwegian parliament) as a key character and symbol for politics and politicians. In addition I created vignettes to be used inside the publication together with the main article. These show different house of cards mockups made by the lion/politicians, each carrying their own meaning. Drawn with pencil on paper and colored digitally. Illustrations for issue 5/2017 of Arkitektnytt, concerning the approaching third sector of obtaining a home, the eventual arrival of alternative models for financing and distribution of residency possibilities in Norway. The way we imagine a home, is finally changing. 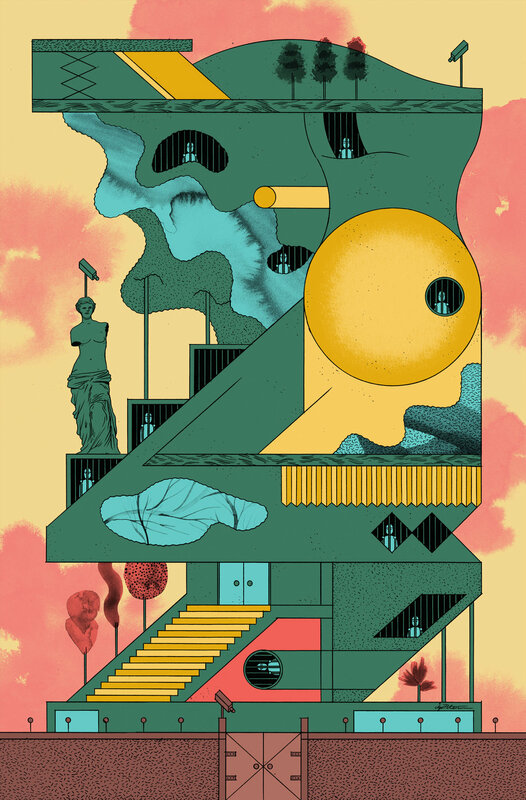 I have done a main piece for the leading article and cover, and eight different vignette-illustrations of imagined homes and ways of alternative living. Cover and opening spread. Editorial design by Bielke&Yang. Two separate illustrations for this issue. One concerning new commitments on export of Norwegian architecture abroad, and the other commenting on the development of creative industries, commercialization of artistic work. I took inspiration from airport baggage scan checkpoints, letting a rolling suitcase contain iconic Norwegian architecture work. Commercialization of creative work. The idea for the illustration is that a certain person – while having the txt-message conversation as shown –procrastinate/builds the figure, with the tools on his/her work table. A figure inspired by a certain rich duck created by Carl Barks. The idea is based on me actually doing this myself last year. 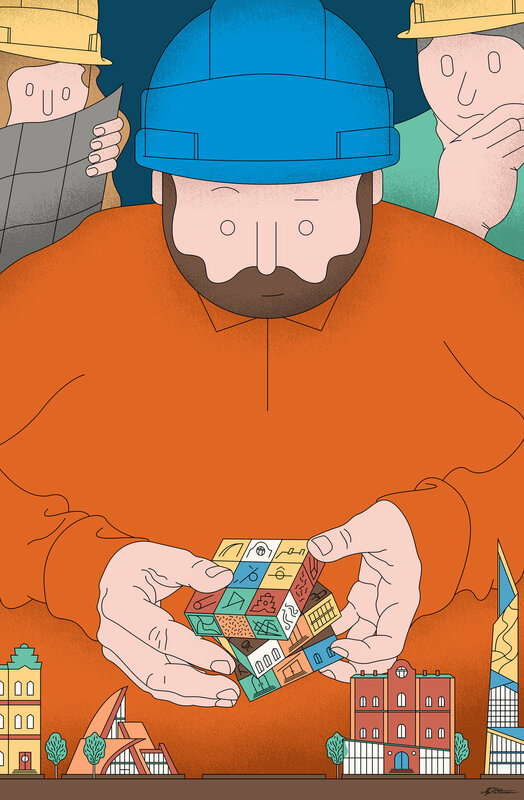 Illustration for an article about the political struggle for the placement of the new NTNU campus in Trondheim. I used the specific form of folded maps and map pins as a visual means to convey a scrambled outlook on it, even with a birds-eye-view, placed around the an architect's worktable, with decision makers climbing about, eagerly pointing in all directions. It's always fun to draw tiny people. Drawn with pencil and ruler, and colored digitally with a main palette of yellow, which was the paper background color for this issue. Two illustrations for the second redesigned (by Bielke&Yang) issue of Arkitektnytt. In short, concerning upscaling in building projects on new transport hot spots. One in the form of a comic strip, playing on the world of boardgames. The other is by far one of my most complex and challenging to draw illustrations so far. A many layered perspective without vanishing line, combined with transparent walls. All in charge of depicting a semi futuristic scene from a family life along a main artery of collective transportation. A collective life. I stood as a sitter for the drawings for both mom and dad, and you can see these reference photos on the blog section of this website. Worth mentioning is that the paper color background changes with each new issue, which functions as starting point for the color palette in my illustrations. 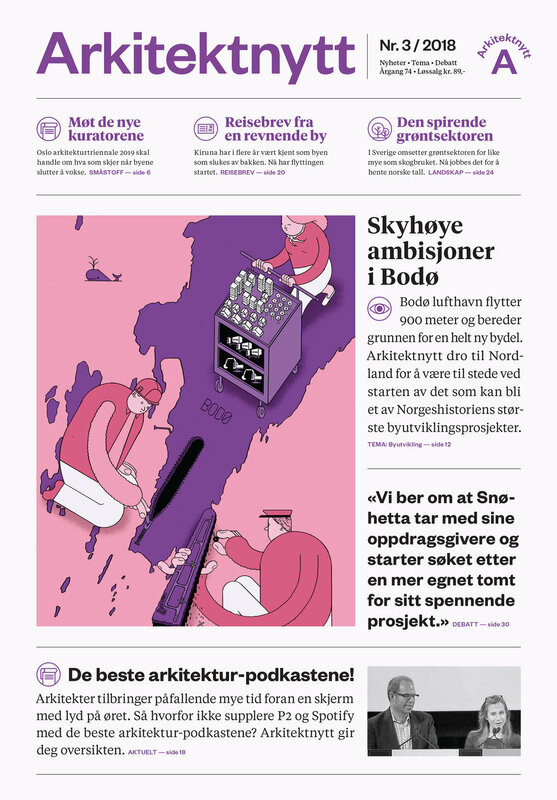 My first work for Arkitektnytt as their new editorial illustrator. Redesigned by Bielke&Yang, both for paper and web. My three illustrations for this release concerns TEK17 and suggested new and much more relaxed regulation demands in new building projects. One of the illustrations is in the form of a comic strip. In english: «The ladder is not included in the price».